Gruden will reportedly get the job on Tuesday. So who will ESPN hire to replace him? 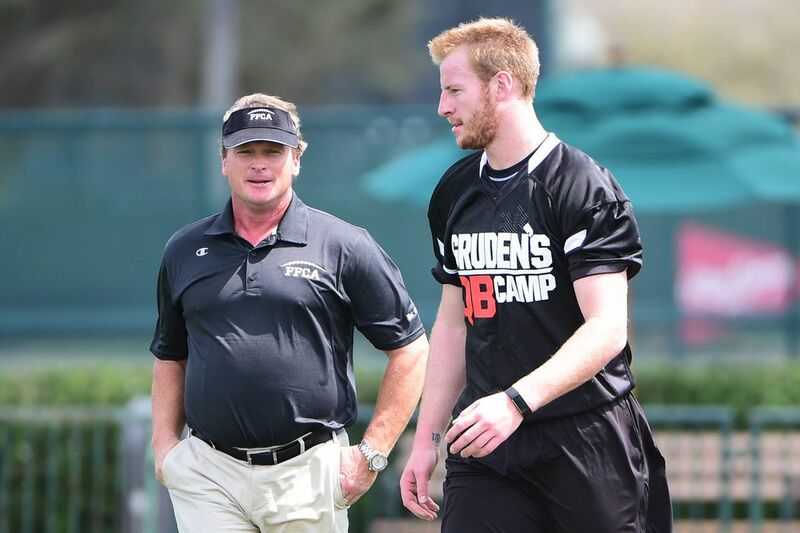 ESPN Monday Night Football analyst Jon Gruden speaks to Carson Wentz ahead of the 2016 NFL Draft as part of his “Gruden’s QB Camp” program. Gruden is reportedly leaving the network to join the Raiders as their next head coach. The worst-kept secret in the NFL now appears to be a done deal: ESPN Monday Night Football analyst Jon Gruden will be the next coach of the Oakland (soon to be Las Vegas) Raiders. According to multiple reports, the Raiders will introduce Gruden as their head coach during a news conference Tuesday. An ESPN spokesman has confirmed that Gruden would still call this weekend's AFC wild-card playoff game between the Kansas City Chiefs and the Tennessee Titans, along with play-by-play man Sean McDonough and sideline reporter Lisa Salters. ESPN's Adam Schefter and NFL.com's Ian Rapoport both report that Gruden's contract will be the longest coaching deal in NFL history, spanning 10 years and likely approaching $100 million. Gruden said on Golic & Wingo earlier this week that there was "no truth" to ESPN's own reporting that the Raiders would offer the broadcaster an ownership stake in the team. Gruden was hired by ESPN in 2009 after amassing a 100-85 coaching record in 11 seasons as an NFL coach. In 2001, he led the Raiders to the AFC championship game against the New England Patriots, and the Raiders lost in part because a Tom Brady fumble was overturned by the league's controversial "Tuck Rule." After being traded to the Tampa Bay Buccaneers following the 2001 season, Gruden led the team to its first Super Bowl win, as the Bucs defeated the Raiders in Super Bowl XXXVII, 48-21. He was added to the Buccaneers' ring of honor this season. Gruden will become the fourth ESPN analyst in recent weeks to depart Bristol for a head coaching job, following Chip Kelly (UCLA), Aaron Boone (Yankees) and Herman Edwards (Arizona State). So who will replace Gruden? ESPN reported his impending departure on its homepage, but the network's communications team still won't confirm that Gruden is leaving the Monday Night Football, so it's probably too early to speculate. It certainly will be a challenging position to fill for ESPN, since Gruden is more than just a voice in the booth; he is an important part of the network's NFL Draft coverage, contributes to its extensive Super Bowl coverage and his Gruden's QB Camp series remains popular with fans. With no Tony Romo-like candidate waiting to step in (other than Peyton Manning, who has said he's not interested in broadcasting), it's likely that ESPN will fill the spot with in-house talent. Sports Illustrated's Richard Deitch reported that one name he heard repeatedly in discussions with TV executives and broadcasters is current Sunday NFL Countdown analyst and former Seahawks quarterback Matt Hasselbeck. Monday NFL Countdown analyst and former 49ers quarterback Steve Young could also be a leading candidate, and has experience calling games on Monday Night Football. An outside candidate who might garner some interest from ESPN is former Rams and Giants quarterback Kurt Warner. Warner served as a color analyst for Fox Sports during the 2010 season, and was hired by Westwood One in 2014 to fill in on Monday Night Football games when regular analyst Boomer Esiason is unavailable.